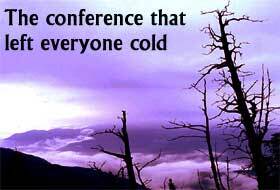 At the end of it all, it was just another climate change conference. There was rhetoric, vague statements, shadow boxing, but little meat. Before it began, the world was looking at it seriously. But once the Eighth Conference of Parties to the United Nations Framework Convention on Climate Change (COP-8) began in New Delhi, it was clear that little would be achieved, much to the chagrin of the attendees. Kate Hampton from Friends of Earth International, a federation of autonomous grassroots environmental organizations lamented the failure of the Delhi conference. "Strong leadership is urgently needed to resolve outstanding issues and end North-South polarization," she said, "Instead of waiting idly for entry into force of the Kyoto Protocol, governments should be increasing momentum and carving a path towards an equitable and adequate global agreement to save the climate." India hosted the conference that saw 4,000 delegates from over 170 countries turn up. Many developing countries expected India to take the lead in asking the developed countries like the United States, Canada, and Australia to ratify the Kyoto Protocol, the United Nations Framework Convention of Climate Change formula in which the developed world is to cut down its their greenhouse gas emissions in a phased manner. But so lacklustre and lackadaisical was India's initiative and performance that Climate Action Network, a worldwide group of green non-governmental organizations, awarded India what it called the 'Fossil of the Day Award' for non-performance. Climate Action Network declared that it was giving the award to India "for failure to take leadership to make COP-8 a success and a concrete step forward." It added, "Being host to an important conference on climate change and one of the largest countries of the world implies a certain responsibility to these negotiations and India has not lived up to these expectations." The fact is, at the end of a long conference that ended in early November, the developing countries simply unable to persuade developed countries to easily part with the technology to reduce greenhouse gas emissions. Developed countries continued to sing the same song that they could not be held responsible to clean up the atmosphere even though they were the largest polluters. The Kyoto Protocol has to be ratified by at least 55 countries to make it an international law. As of now, 96 countries have ratified. The catch is that for it to become legally binding, the countries ratifying it must account for 55 per cent of all emissions that were prevalent in 1990. As of now, the emissions of the 96 countries ratifying it work out to a mere 37.4 per cent. The biggest polluter, the United States, accounting for almost 35 per cent of the emissions today, has consistently ignored the Kyoto Protocol, and instead said that developing countries like India and China need to control emissions. Even before the conference started, Indian negotiators were wary of the fact that developed countries would raise the controversial Asian Brown Cloud, a haze over Asia, supposedly caused by excessive pollution. The United Nations Environment Programme had said the cloud was caused by excessive fossil fuel burning in countries like India. As expected, the subject came up, forcing India to say that further studies needed to be done to establish the details. Clearly, the cloud had become more of a political issue. The hope now revolves around Russia and Japan as in the past they have shown a willingness to consider ratification. Should Russia ratify then the 55 per cent clause would be met. Indian Environment and Forests Minister T R Baalu said he was confident that Russia would ratify as he had spoken to some Russian ministers on the issue, but thus far, Moscow has shown no haste in ratifying the Kyoto Protocol. Harlan Watson, US climate negotiator, said for his country to ratify the Kyoto Protocol, it would require at least 67 votes in the [100-strong] Senate. This, he said, was not going to be easy as there was a widespread belief among the American public that the ratification would hurt the US economy while letting developing countries continue to pollute the world. Developing countries had to fend off intense pressure from developed countries like the United States, Japan, Australia, Canada, the European Union, and Switzerland to take on commitments to reduce greenhouse gas emissions. The only highlight of the conference was Indian Prime Minister Atal Bihari Vajpayee's belligerent statements that the developed world must first cut down emissions before asking the poorer world to stop developing. "The per capita greenhouse gas emissions of the developing countries were just a fraction of the world average and much below that of the developed countries," stated Vajpayee in his address to the conference, "It will stay that way for many decades to come and the ethos of democracy could support only the equal per capita rights to global environmental resources. Tragically, developing countries would bear a disproportionate burden of the adverse impacts of climate change. Hence, there is a need to pay attention to the concerns of developing countries on vulnerability and adaptation issues." Developing countries have argued that poverty eradication is the most important element of sustainable development and that adaptation strategies need greater focus. Said Dr R K Pachauri, chairman of the Intergovernmental Panel of Climate Change, "The impact of climate change are expected to fall disproportionately upon developing countries and the poorest communities within those countries." The Chinese delegation said the gap between rich and poor has been increasing and both socio-economic development and eradication of poverty were the priorities of developing countries and it had to move on to climate change from these realities. Just three days before the international meet, India's Science and Technology Minister, Murli Manohar Joshi said that the climate policy of rich nations was flawed because of the consumption patterns it had. "So long as the goal is to attain higher levels of consumption with unlimited consumer choice and profit maximization, efforts to tackle the imbalance between man and his ecosystem had little chances of success," he said. India has been very keen on adaptation and formalizing ways on how countries should go about it to meet the challenges of climate change. But in spite of all the hot air generated at various international meets, hardly any worthwhile financial or technological aid has been forthcoming from the developed world. There was nothing new in the Delhi Declaration. It just said that adaptation was important since climate change would affect the poor the most. European Union representative Thomas Becker said it agreed to the declaration to keep the process going, as "a failure here would have been disastrous." The EU had no hesitation in saying that the declaration lacked action and direction for the future. Greenpeace climate policy director Steve Swayer asked angrily: "Do we want to protect future generations from climate change or be remembered as the ones who were too self-centred, too greedy, too lazy or too cowardly to make the decision needed to help save us all." Sadly, no one was listening to him.